Soothe and comfort your body by soaking in a warm bath. 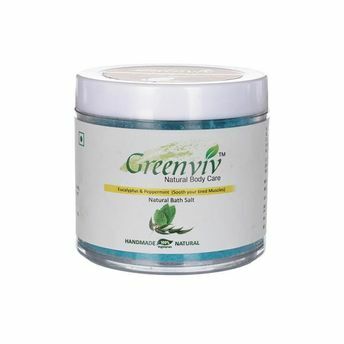 Soaking in this Greenviv Natural Eucalyptus & Peppermint Bath Salt helps balance moisture in the skin and body, cleans pores, soothes skin and relaxes muscles. Infused with beneficial ingredients, it helps to rejuvenate both body and mind. Explore the entire range of Bath Salts available on Nykaa. Shop more Greenviv products here.You can browse through the complete world of Greenviv Bath Salts .